I have a set of “grown up” alphabet letter blocks as part of my living room décor. With these blocks, I can create a wide variety of sayings and greetings—pretty much anything that can be said in 18 or fewer letters. I have had the letters for many years, though I don’t remember which mail order catalogue I found them in. After my initial set of letters, I asked for the images and numbers for Christmas (or my birthday) one year. Over the years, I have used the blocks for greetings, holiday sayings, birthday wishes, announcements, etc. The sayings have a spot on the top of the shelf-unit where the television sits. The shelf is six feet high, so I create the sayings on the living room rug, and move the words to their perch one at a time. I move the bottom word first and work in ascending order, placing one word on top of the other until the message is complete. For many years, I could create a saying, place it on the shelf, and not even think about it again until I it was time to change it. Lately, however, I have noticed that the sayings I write are often … well, altered in some subtle (or not so subtle) way. For example, my Christmas message: Joy, Peace & Love morphed over time. 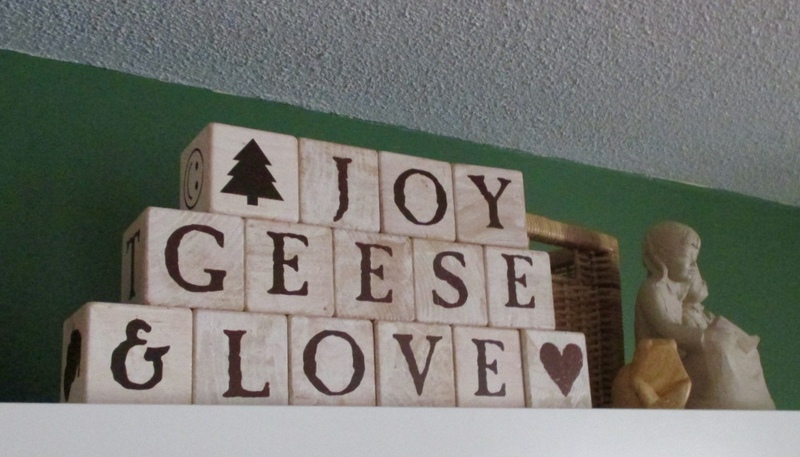 After only a couple of days of sitting on the shelf, it suddenly read: Joy, Geese & Love. Hmm… because everyone hopes for geese at this time of year…? Now that everyone is tall enough to reach the block sayings, it’s anyone’s guess as to how the message will change from what I write, but there is no doubt that it will be altered in one way or another. I can only sit back, relax, and anticipate the changes. Certainly, the message I put on the shelf makes sense. At least for the first day or two…. Stuffing stockings—one of my annual Christmas challenges. Have I found enough stuff to fill each stocking? Will I have too much stuff, and if so, what will I do with the extra? 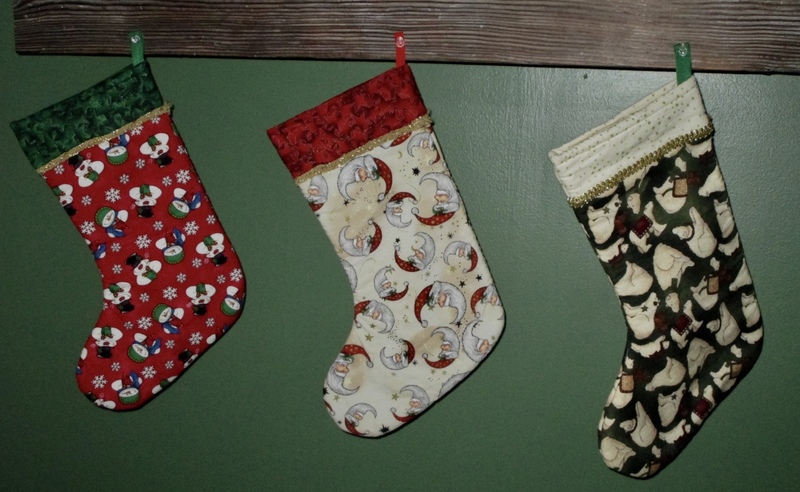 Even after years of filling the same stockings, I always second-guess myself. This year, we approached the holiday in “scaled down” mode. Finances are a little tight, so when I was searching for stocking stuffers, I decided to go the practical route. In addition to some toiletries, toothbrushes, and a tiny puzzle-y-thing or two (okay, and the requisite chocolate…), I purchased socks and underwear to fill the extra space in the stockings because, well… practical (and necessary). When I started to actually fill the stockings, I found that I did not have enough room for the underwear. I had purchased a package of underwear for each of the teens in my house. While the packages were a good idea and would have taken up a sizeable chunk of space, the stockings were full enough without them. So late on Christmas Eve, I made the decision to place the packages of underwear in the children’s rooms, as if Santa, himself, had gone to their rooms to check on them and placed the item there. On Christmas morning, I wanted to make sure none of them missed this amazing Christmas treasure. W was the first one up. “Did you see that there is underwear in your room?” I asked him. “Yes,” he told me, and then his face brightened. “I was so excited that I had to wake C to let him know. ‘Santa came! Santa came! And look what he brought us: new underwear!’” he recounted the scene for me, and I had to smile at his sense of humor and fun. In fact, he actually did wake his older brother with his humorous rendition of childlike Christmas excitement. And because that childlike excitement of their younger days has tempered to a much calmer holiday emotion, I always smile at the moments like this one—humorous or not. The big brother who is trying to sleep in … maybe he doesn’t find these antics quite so entertaining. Each year at Christmas time, I bake several different kinds of cookies, which I immediately place in the freezer until Christmas Eve. On that day, I make up plates of cookies and distribute them to friends and neighbors. 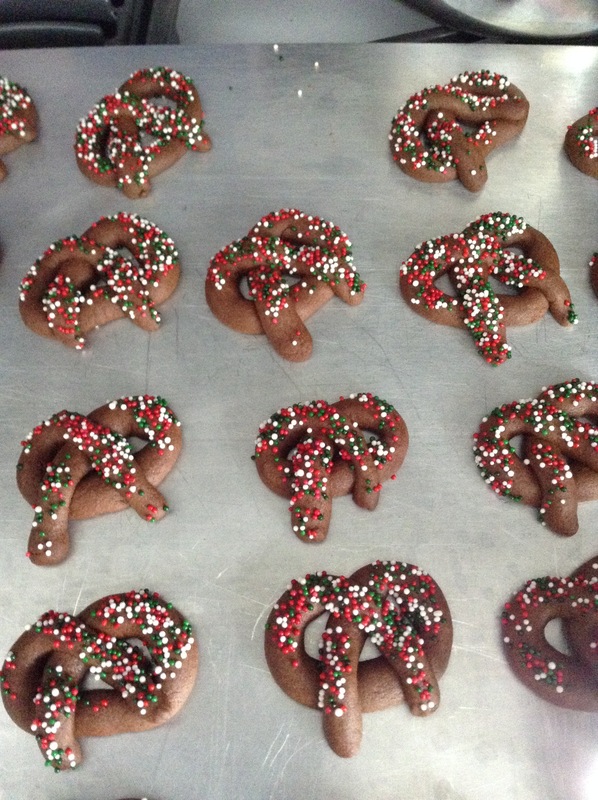 The day before my son came home from college, I texted him a picture of his favorite Christmas cookies. (Please ignore the fact that one is missing from the cookie sheet. It accidentally slipped from the spatula into my mouth when I was freeing them from the pan. Quality control is imperative, you know). “Yum!” he texted in reply. When he arrived home the next day, we sat down to dinner, and when we were done eating, he looked around the kitchen. “Where are the Christmas cookies?” he asked. “That picture was from last year,” I lied, realizing I shouldn’t have let him know his favorite cookies were in the house. 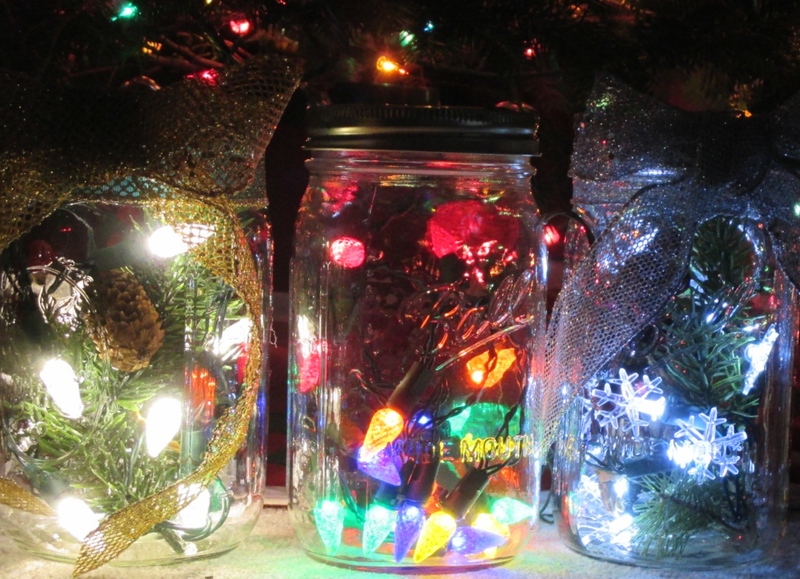 In my head, I could picture nearly empty containers of cookies on Christmas Eve…. And then I felt bad for telling him I didn’t have any. What kind of mother was I, sending him a picture of his favorite cookies and then telling him they weren’t in the house? I was caught between a lie and the possibility that my cookies would disappear before Christmas Eve. I took a deep breath to calm myself. “They’re down in the freezer,” the words escaped me in a very small, quiet voice. I sat back and watched as he ate a cookie. Then another. And another. Finally, I spoke up. “You have to put the cookies back in the freezer now.” And he did. Of course, I haven’t checked the contents of the containers since that night about a week ago now, so I am only assuming he hasn’t had more since. But having my cookie connoisseur home with me has its advantages, as well. Last night, I made a new type of cookie for my Christmas plates. When they came out of the oven, I cut one in half and tried it. It was good. I brought the other half into the living room for C, who was the only one still awake. He thought it was good. Of course, half a cookie isn’t a good indication of whether or not a recipe is actually tasty. A little while later, C came into the kitchen and asked if he could have one of the cookies fresh from the oven. I nodded and steered him to the baking sheet that had been cooling the longest. I was at the sink cleaning up the dishes. I pretended not to notice when he polished off his first full cookie and took another, but secretly, I knew these cookies were a success. Score one for the new recipe! Many people have stories of strangers who seem to materialize out of thin air just when they most need help. And once the strangers have provided the necessary assistance, they disappeared just as suddenly. In fact, this once happened to me. My story happened many years ago. I was working in a boarding school, and since I lived in a dormitory, I would often take students on shopping trips or outings. This particular weekend, I had promised a group of students that I would take them to see a movie on Saturday evening. Initially, Saturday was a clear, cold day. 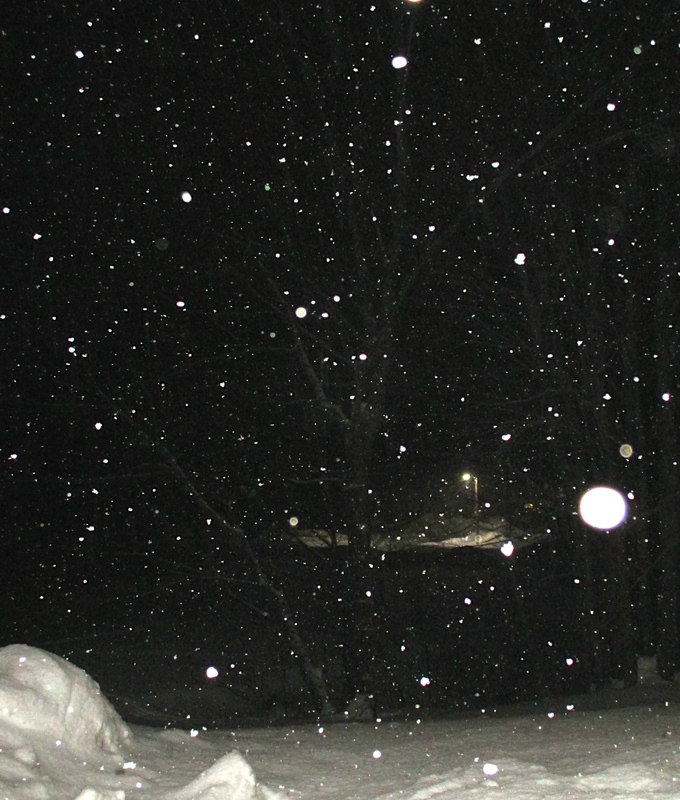 However, by the time evening started came around, it was snowing. Hard. The storm was not supposed to be lengthy—only a brief snow shower—but its poor timing could affect our trip. The four girls I was taking to the movies were keen to get off campus, and I was much more adventurous in my young adulthood. After much back and forth, we decided to set out on the trek to the cinema, knowing that we could always turn around if the roads were bad. As I drove, the falling snow obscured my vision and ensured I maintained a crawling pace. The roads were covered in a deepening layer of snow, but I inched along. Few other cars were on the roads, and the only light was that of my own headlights as we continued on our journey. We were nearing the intersection of the main road (which I knew would be clear) when my slow-moving vehicle hit a patch of ice and for a brief second, the car would not do anything I wanted it to do. I tapped the brakes and turned the wheel, but the car’s momentum took it in a direction I did not want to go. The car swerved off the side of the road and continued into a small ditch where we came to a stop with a jolt. I took a deep breath. “Everyone okay?” I asked, as I ran through the list of possible ways out of this mess. Back then, there were no cell phones, so calling for help was not an option. No doubt, there would be some walking involved on this very snowing, rather dark night, and I had the sudden realization that sneakers might not have been the best choice of footwear on a snowy night. I said a silent prayer, and in the rear view mirror, I saw the headlights of a passing car, the first I had seen for several miles. The car slowed and stopped. Several young men got out and approached my vehicle. I rolled down the window and in the rearview mirror, I caught a glimpse of the surprised expressions of the girls in the backseat as they looked at each other. “You need some help?” one of the young men asked. “I guess I kinda do,” I replied, as I put the car in reverse. The young men surrounded my vehicle, and I pressed the gas pedal as they pushed it up and out of the ditch. In just a few seconds, the car was freed from the ditch and back on the road. The young men ran back to their car. “Thank you! !” I hollered after them out my still open window. Their car passed me and disappeared in the still falling snow. I closed the window and continued the slow trek to the main road. Indeed, one could say we were very lucky that night. But I’d like to think there was a bit more to it than luck. Divine intervention or no, that night showed me the amazing way our lives all work together for the greater good. Monday was a snow day in our school district, the first for the school year, and an early one, at that. Despite the fact that a day off will have to be made up at the end of the year, I must say, it was a welcome break at this busy time of year. Throughout the day, it seemed my daughter’s mood was fueled by the energy and anticipation that pre-Christmas snow days can bring. I was folding her laundry when I realized I once made a sweater very much like one she had in the wash. I dug it out of the cedar chest and brought it to her room. I let her know that I made it when I was in college, and asked her if she would want to wear it. 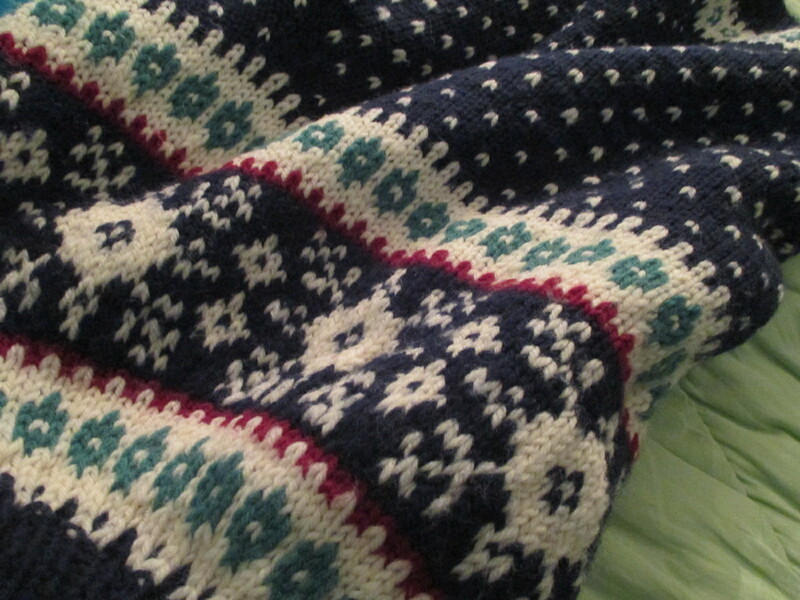 “Um…” I started, reminiscing on the January term that I had painstakingly knit the sweater in question, placing each stitch of the Fair Isle pattern in exactly the right place. And now it was considered an ugly sweater? She looked up and saw my expression. “I don’t mean this is an ugly sweater,” she back-tracked. “But it would work for the party because it’s in the style of an ugly sweater. There’s a difference.” This last bit was said as she turned to walk back into her room. No doubt so I would not see her silently laughing. She looked them all over. “Don’t worry,” she assured me as she selected a cookie. “There are plenty of ugly ones here.” Indeed. Still later, I was coming up the stairs from the laundry. I had been singing made up songs that probably were a bit crazier than I thought. “Hey Mom…. Oh, never mind, that wasn’t going to come out right,” she said as I entered the living room. “You’ve spent the day saying things that didn’t come out right. You may as well just say it,” I coaxed. It was actually a challenge, but she didn’t know it. “I’m not planning anything. I’m just preparing. In case you might be going crazy….” Her voice trailed off. “But don’t worry. I’d take care of you at home before I put you in a facility.” She smiled that sweet smile that let me know she was going to do whatever she needed to once I had slipped into the depths of crazy. It’s always nice to know your kids have plans to keep you safe. I might have thought that was a very sweet thing to say. But as teenagers too often do, she continued down this road, one she should not have traveled. “They might be laughing, Mom, but they would be laughing with you, not at you. Because you just said you know how ridiculous you would look.” And again, the smile. Ah, life with teenagers. If you ever have a moment when you think you might actually feel good about something, just wait. One snarky comment, and they will humble you in an instant. And if I am perfectly honest… I wouldn’t want it any other way! At that university where I work, I meet with student writers from all walks and backgrounds. I mainly meet with undergraduate writers, but I also work with students who are professionals in the midst of careers—returning to school for professional development or to get a degree. And then there are the graduate students who range in age from 22 to 92. Recently, I met with a woman who was an acquaintance of mine in a former iteration of my life—years ago when I was single and worked a different job. She is in a demanding graduate program, she works full time, and she deals with the every day stresses and curve-balls of life that we all deal with. She was struggling. Her professor had told her that her final essay could end her participation in the program; she was under more pressure than usual, and she was taking it out on herself. Briefly, she let me in on the frustrations she had with the class—the only class in which she had struggled in the program thus far. Now, she felt the need to put exactly the right words on the page, which is never good for the writing process; she was over-editing because she felt under-confident. I asked her how many classes she had completed in the program. Seven. And then I reminded her that she had seen me two years earlier—when she had first started her program—feeling almost exactly the same way. And I reminded her that she hadn’t seen me since. “What is it about these two classes that stripped you of your confidence?” I asked her. Her response had nothing to do with school. She mentioned the loss of a loved one several years earlier; the holiday season without that person; the stresses of her work; a birthday celebration that needed to happen in the midst of everything else. And the pressure to finish this one last paper. Often at this time of the year, we are too able to focus on what’s missing. The longing for what is missing blurs the present and what we have. And sometimes, we don’t even consciously recognize that we are struggling with loss or stress or the need to be everything to everyone. And so I say this: be gentle with yourself, not just at this time of year, but always. You are not alone. We are all in this together. Chances are, if you are willing to say, “You know what? I am struggling today,” someone will step in to offer support and to lift you up. 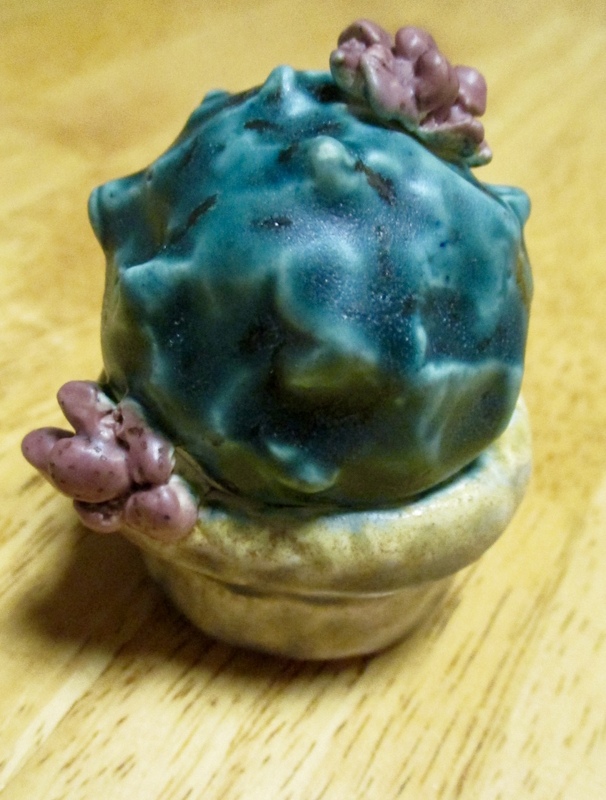 I examined the ceramic cactus in my hand. It was “growing” in a pot that almost looked like a wicker basket. The plant had understated spikes that gave the green ball a distinct cactus look. And the cactus bloomed with two dusty pink flowers. “It’s beautiful!” I told her when I had finished my inspection. “I made it,” she told me. “No you didn’t,” I responded, only partially convinced by her words. “Yes I did. It came out of the kiln yesterday.” And then she turned it upside down, so I could see the bottom. “My initials,” she pointed out. Indeed, the bottom indicated that the piece was handmade. And it was beautiful! She just started taking a pottery class at school, this year. I can’t wait to see what else she brings home!